As we said before... Bailey Drew is here! God was so good in the delivery of our special little girl. And this is the story from my perspective... and again from Andrew's. The wonderful doctor and nurse Andrew and I worked with... we had an amazing birth team! Thursday night, Stasia told me that she was feeling different. However, I had grown accustom to not getting excited too early so I tried not to think too much about it Friday. When she came home Friday night and we were on our way to some friends of ours to watch a movie, Stasia told me that she had been feeling more contractions that evening. I started getting a little excited, but we knew that it could be false labor, so we just waited. During the movie, I noticed that Stasia was uncomfortable and fidgety. She was also on her phone a lot. After we left, she told me that her contractions had been consistently ten minutes apart. I remember walking to the car and feeling excitement and nervousness. Was this it? What were we really getting ourselves in to? We got home from our friends and we settled in on the couches and waited. We watched some television to distract ourselves as we waited to see if the contractions continued. Throughout the night the contractions continued to get stronger and closer together. As they did, I got more excited and worried about Stasia and Bailey. Were they going to be alright? How much pain would she go through? Would Bailey be alright? What kind of parent would I make? All of these questions ran through my mind as we lay on the couches waiting. I had to keep praying to God to give me a peace about the entire process and to help me to rest in His sovereignty. Stasia was incredible and finally told me to get some rest, so I was finally able to sleep for a couple of hours. When I woke up, I could tell that they were getting stronger as Stasia was noticeably more uncomfortable. We got ready for the day and called our parents to let them know that we were in labor. We then got all of our stuff ready for the hospital and began using all of the different things we learned in our Bradley Method birthing classes. It was stressful watching Stasia go through so much, and I hated seeing her in pain knowing there was little I could do to help. After hours of labor at home, we decided that it was time to go to the hospital. By that time, our birthing coach, Amy, had joined us and was helping me watch the contractions and giving us advice. She really was an incredible help to me and I will be forever grateful to her. We got in the car and I drove as fast as I safely could to get to the hospital. We got checked in and went upstairs to our room. It was at this time that we had our most difficult time. The doctors checked Stasia at this time and told her that she was only three cm's dilated and 90% effaced. The look of disappointment on Stasia's face was awful. I knew she was down, but I tried to point out that she was 90% effaced and was definitely in active labor. However, I was disappointed as well and nervous as to how long this was going to take. Once at the hospital, Stasia really started going through the most difficult parts of labor. I can't express how incredible she was. She did not scream or yell or even make a lot of noises. She was completely focused on getting through each contraction and resting in between. I tried to remind her to breath during the contractions and to rest in between them. The nurses were also incredible during this time. They worked with us, allowing Stasia to move around and brought us everything we needed. They were positive and encouraging regarding our desires to give birth naturally. I was very grateful for them. They came in and checked Stasia again, and I was very nervous. To our delight, the nurse told us that Stasia was at 8 cm's! Stasia and I were so excited, knowing that things were moving along. After only a few hours she had progressed so much. Praise God! It gave us the energy and focus to get through the next couple of hours, which were very intense. Finally we were able to meet our doctor. The doctor we had been with throughout the pregnancy had to go out of town and we had no idea who our doctor would be. The Lord was watching over us because this doctor was incredible. She never questioned our desire to go naturally and was unbelievably helpful. When the time came to push, she talked Stasia through each step, never losing her cool and always being positive. We got to 9 1/2 cm and the doctor was able to get the last half cm pushed around the baby's head and we were down the home stretch! 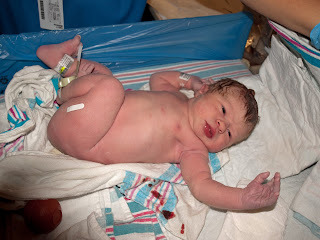 Stasia, as always, was incredibly strong as she pushed through each contraction. Finally, Bailey Drew Skelton was born and gave us a little cry to let us know she was here! I will forever remember meeting our baby girl for the first time and am so thankful that God brought her into our lives.